Whale Shark Diving in Belize | Dive Industry Association, Inc.
Every year divers flock to Placencia Belize to dive and snorkel with whale sharks – one of the few places the world where you can expect whale sharks to arrive on a scheduled basis (although they do not always seem to carefully check their calendars). The Gladden Spit and Silk Cayes Marine Reserve located near Placencia in Southern Belize, is a spawning aggregation site for many different tropical fish species including cubera, mutton and dog snappers which produce tons of spawn. This spawning occurs around the full moon to last quarter during the months of March to June. This is what attracts the Whale Sharks to the Gladden spit. Whale sharks are the biggest fish in the ocean growing up to lengths of 60 feet/18mt. Divers and snorkelers get a rare opportunity to swim along with this magnificent creature. The wall here slopes down to 160 feet/50mt then drops off into the blue abyss. Diving is done in mid water at a depth no deeper than 80 feet/24mt in groups no larger than 12 divers with their dive masters. Special procedures are followed on this dive to ensure safety and to limit any harm that may be caused to the sharks. Snorkeling is done on the surface in open water, however snorkelers have an excellent chance of seeing the whale sharks as they come to the surface to feed. Splash Dive Center uses two methods to find whale sharks. – looking for the snapper or looking for the birds. We use fish finders to find the snapper as the whale sharks come to feed on the spawning aggregation and put the divers in the water above the snapper. The divers try to stay with but well above the snapper and try to stay in a tight group so that the bubbles are concentrated. 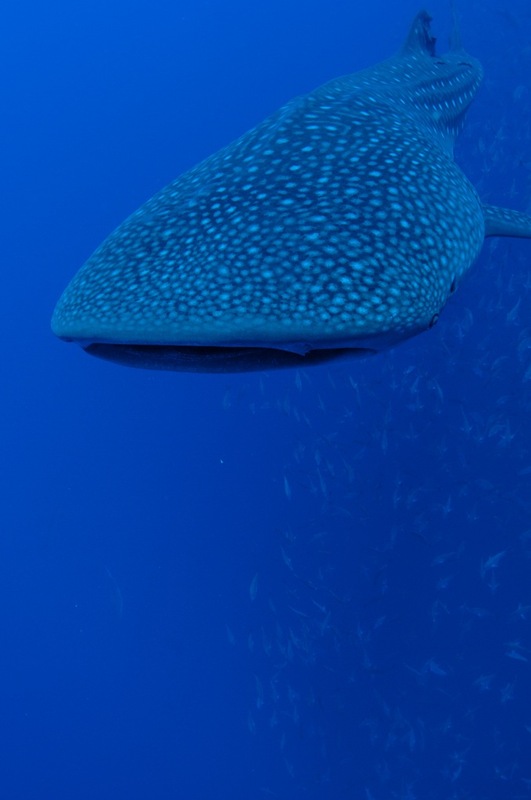 The idea is that the whale shark will see the bubbles, think that is the spawn and come directly to the divers. As the bubbles go to surface, often the whale sharks do too, so the snorkelers get a close encounter. We have had some situations where the whale sharks came from the side rather than from the deep, so the snorkelers saw them but the divers who were looking down, did not see them. Other times, the whale sharks have come close to the divers and then gone back down without tasting the bubbles. The dates for the next two whale shark moon seasons are; May 29th to June 10th and June 28th to July 12th. Whale shark diving is blue water diving with no visual reference – you cannot see the reef or the bottom. For that reason, with diver and guest safety paramount, Splash only takes advanced or experienced divers (30+ dives) to dive with whale sharks. Splash also requires all divers to have done at least one dive tour with us before we take them to dive in the whale shark zone or to the Blue Hole (check out dive).